It had been raining, quite a lot actually. The course was in a plot of land that was maintained by landscapers who were able to do their best to “fix” the course after all the rain we got. Lots of gravel over the knee deep mud bogs made for semi rideable bogs that resembled drying concrete more than gravel or mud. To make the course even more interesting, the wind was whipping. Normally for an XC mountain bike race, that’s fine. You’re in the woods and are mostly unaffected by gusts. This course had many exposed sections. Parts where you would ride a double track through a field with no place to find shelter. This was the battle of the Willowsford XC race; the course more than all else. I came into the race with little knowledge of who the key players were. Knowing your opponents is half the battle in racing, but I didn’t have the luxury, so I was blind. With a smaller field of about 21 guys, I figured the cream would rise to the top very quickly; it did. A short road prologue strung us out a bit. Even with my efforts to get near the front, I was still about 6 wheels back when we hit the dirt. I moved up quickly and soon was in second position. A small climb came and I juiced it a bit to see what would happen. A gap quickly formed so I pressed on to hold it. About a mile later, Kimani Nielsen bridged up just as we entered a very windy field. We worked together trading pulls, navigating the slow, boggy trails and tried to hold our advantage. Only a few minutes later, Bjarke Refslund towed Anthony DeLauder up to make our group a foursome. Taking a quick look back and seeing no one within 30 seconds, I realized this would be the selection. With virtually no hard trails on course, the only relief from the mud was on the double tracks in the fields, amidst getting blasted by wind. It felt like an endless and evil cycle. Grind through the mud, blow around in the wind, grind through more mud…. The third lap came and Bjarke and Kimani began ramping up the pace. I sat in fourth wheel, a spot I had earned by dabbing in one of the deep mud sections. I began to deeply appreciate my position as it gave me the advantage of seeing how everyone was riding. The body position and pedaling told me exactly who was feeling good and who was suffering. On one of the last climbs Kimani attacked and immediately put a few seconds into our group as we entered a windy field section. As soon as I could get around I bridged, dumping most my effort into it. A quick glance back showed Bjarke and Anthony had not followed. I got up to Kimani and the double track turned the gravel. With a nice crosswind, I was desperate to find some rest in his draft which was somewhere just next to his rear wheel. He played it smart though and rode the far right side of the road so that if I wanted to draft him, I would have to ride through the wet grass. We suffered on and soon Bjarke showed up, towing Anthony back to us to make it a nice foursome again with only 1.5 miles to go. Clearly Bjarke and Kimani were feeling good. I was getting nervous, but knew the last climb that ended 400m from the finish would tell all. One more downhill to the base of the final climb and Bjarke came around Kimani and I to move into the lead. I glued myself onto his wheel as he passed and began the final climb in second position. The first half the pace was manageable but I had my eye on the ground next to me waiting for an attack. I heard the shift POP, and Kimani came around. I jumped hard to get on his wheel and we powered to the top. 300m to go, slightly downhill, a flat section and the finish. We began the descent and Kimani pulled over, hoping I would come through. I slowed, indicating I was not going to pass him. Bjarke was cresting the hill now and pushing to catch back up. So Kimani put his head down and went for the line. I sat on until about 100m to go when I gave it everything and came around him to take the sprint. It was without a doubt the most tactical mountain bike race I have ever raced! Winning like that was awesome. I may not have raced the hardest, but I definitely had the smartest race, and that got me the W. It wasn't just the tactics though. 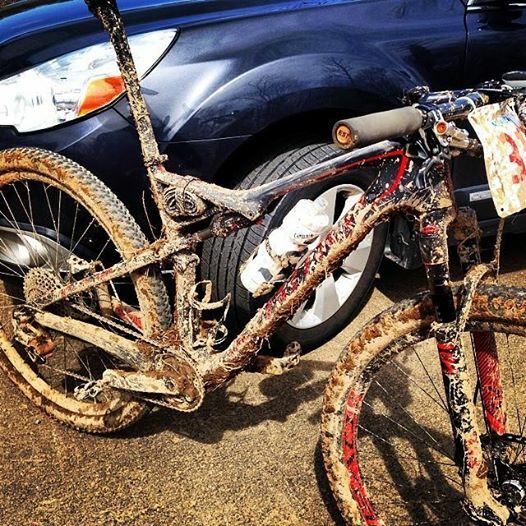 Look at the mud on my Specialized Epic World Cup! Even with all that I didn't have any issues with the bike or the X01 drivetrain! Incredible.